Not too long ago, a major Christian conference came to our city. Guests were coming from all over the region to attend this multi-day event. Members of our church offered their homes to host out of town guests, as an act of Christian love, that of hospitality. 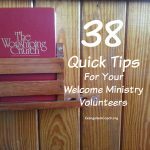 Christian Hospitality is a larger topic than Church Hospitality, so I want to step out of the normal grove here at EvangelismCoach.org and look at this practice, particularly hosting Christian workers. The act of hospitality in general was so important to the church that Paul gives it as a criteria for a church’s leaders. 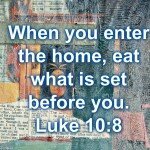 In the lists of 1 Timothy and Titus for elder criteria, Paul mentions hospitality. 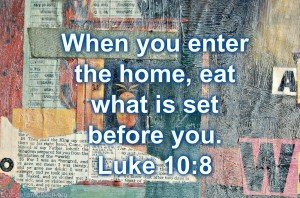 When Jesus sends out workers in Matthew 10:9-16, they are to rely on Christian hospitality to accomplish their mission. When they enter a town, they are to search for some worthy person and stay there. If you are not welcomed, go somewhere else. Christianity hospitality in this form, of hosting Christian workers, opens the doors for ministry. Jesus expects it. We are to be that worthy person that Jesus speaks of. Our home will be blessed with peace (and it is). For example, I once went to Chicago on study leave. I stayed with friends. Their offering of a place to stay saved my study leave budget nearly $500. They invested in me as a Christian worker. It was an act of service on their part, even though their home remodeling is incomplete, nor did they have any extra money to feed me. When I give evangelism conferences that require travel, the organizer will often allow me to stay in their house as a guest, as an investment in the ministry. Of course, there is some wisdom involved in how to host and how to accept being hosted. But that is a discussion for another day. Paul stayed with Gauis when he wrote Romans from Corinth at the end of his third missionary journey (Romans 16:23). What are some of the joys you have experienced in hosting a travelling Christian worker or guest? What are some of the joys you’ve had in being hosted in your journeys? Your hospitality ministry can order a personal training from me. It is a virtual seminar I offer that is travel-free. You can offer it on any night or day that you choose. I’ve even had a request on a Thursday for an event on Saturday morning. Read more about how to get your own church hospitality team training seminar from me.